Jane Nardin has transported our beloved Meg, Jo, Beth and Amy to the British colonies in Little Women in India. It's obvious that Nardin put some work into this retelling. She finds a plausible reason for Mr. May to be away, she gives the May girls each their own flaws to struggle against, and even has young suitors about to compete for the girls' hands in marriage. On the surface, it's a valiant attempt at a homage to one of the most beloved children's books. There are also some very interesting parts of this book. After the period of unrest devolves into actual riots, the May girls find out what they're made of . As each girl is confronted with their flaws, she ends up overcoming it. Whether it be putting vanity aside to get necessary work done, or looking past what she's been taught to decide right from wrong herself, each girl becomes a better person for what she has been through. That being said Little Women in India takes a very long time getting to that point. In showing the reader the girls' flaws, what we are left with are four insufferably vain, naive brats. Even their mother, Mrs May, becomes almost intolerable in her clinging to the old traditions that our girls have overcome. The fact that she mourns the loss of her daughter's fair complexion more than the idea that she almost lost all of her daughters marks her as a flighty woman who barely deserves the title of mother. Other details of the period seem a bit off as well. At the dinner party, it's unclear who each girl was partnered with, and the conversation seems, if not stilted, then at least no in keeping with the event. The idea of being caught in a secluded area with a man should have caused more consternation than it did, if Victorian mores are being adhered to. Also, the idea of calling their laundry 'underwear' rather than 'small clothes' or another euphemism of the area was jarring. 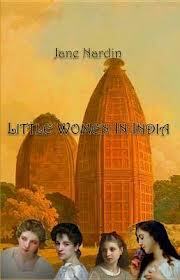 In the end, Little Women in India is a valiant attempt that fell flat on many levels. With the recent dearth of Victorian and Regency historical fiction, from Steampunk to Shades of Milk and Honey, there is steep competition in the marketplace for this time period, and a higher mark to reach. Highs: The girls' flight from the rebels and subsequent ride down the jungle river are nicely detailed and hold the reader's attention. Lows: While it's one thing to give a character flaws to overcome, when each main character is made unlikable it's hard to care if they grow as people or not. Verdict: For the further adventures of the March girls, check out Jo's Boys.